So at the end of last week's show the exiled player was shown completing one of his dreams - running a marathon with his wife. It was an idyllic ending - running hand in hand past the finish line. The somber text following the shot, complete with Biggest Loser music in the background, read that Dane finished the 26 mile marathon with his wife in 3 hours and 53 minutes - a pace that if true would have had Dane placing 14th overall. Dane, though much slimmer than his starting Biggest Loser weight, weighed in on race day at 280lbs. 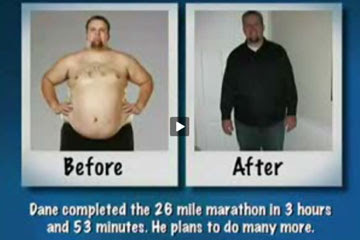 A sub-four hour marathon for someone who's only been training for 6 months who weighs 280lbs to me sounded impossible. Imagine my lack of surprise when the truth actually hit the net. According to a report out of Runner's World magazine's blog, not only did Dane not complete the marathon in under 4 hours, he didn't actually complete it at all. Apparently when it became clear that he would be unable to complete the marathon in the 6 hour time limit of the Arizona Desert Classic Marathon a Biggest Loser show SUV picked Dane and his wife up and gave them a lift. Oh, and even with the lift they didn't finish in 3:53, they finished in 5:53:48. The Biggest Loser's production company Reveille LLC reportedly put out a press release detailing their "error" (I can't find the press release) suggesting there was a problem with the time readout. Certainly I can read 5:53 in the video below and you think that maybe, just maybe the camera guys knew how long it took and that Dane's run included an SUV ride? Looking at the Biggest Loser website I couldn't find anything that suggested they lied to their viewers, nor did I see mention of it last night. Dane, the guy whose incredible weight loss and commitment to changing his life I'm not knocking, isn't planning on giving back his finisher's medal because "in his mind" he finished the race. Now as you might imagine, I don't espouse the ridiculously non-sustainable approaches the Biggest Loser broadcasts as helpful, but that said I've always felt the show was useful for that last two minutes. That's the two minutes where the incredibly dramatic weight loss is juxtaposed with the incredibly dramatic lifestyle changes that contestant has made. I've often said, "the more weight you want to permanently lose, the more things in your lifestyle you'll have to permanently change". I guess I'll have to take some of those changes with a grain of salt too as clearly lying is something the show espouses. To watch a video of last week's last two minutes, click on below.